Facts based on what we learnt from Lee Min Ho and Jun Ji Hyun's latest blockbuster drama Legend of the Blue Sea. You may be the surrounded by the hidden mermaids, call them out! Well actually, they can be Chinese too. It seems like they are also pretty eloquent in the Korean language. There may be an underwater Korean school, right? That colleague who loves to swim and loves sashimi could actually be a mermaid. 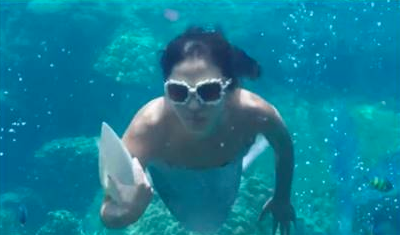 Underwater sunglasses and sea shell clutches... You can't strut in the water but you certainly can swim in style. Kissing a mermaid? If only every one of them looks like Jun Ji Hyun (or Lee Min Ho). Heo Joon Jae (Lee Min Ho) is a genius conman with a heart of gold, adept at playing tricks, bluffing, and twisting words to suit his goals. Shim Chung (Jun Ji Hyun) is a mermaid, whose centuries-spanning love has brought her to present-day Seoul in search of the man who saved her in the past and whom she still faithfully loves. When the two meet, what sparks will fly as the mermaid attempts to adjust to life on land, and the swindler finds himself falling in love with this quirky girl? Catch the hottest and highest-rated blockbuster series Legend of the Blue Sea, first and exclusively on ONE HD (Astro Ch 393). Airing within 24 hours of its Korean telecast, every Thursday and Friday at 8.10pm.